We Offer a 7 day rain insurance on your cleaning! 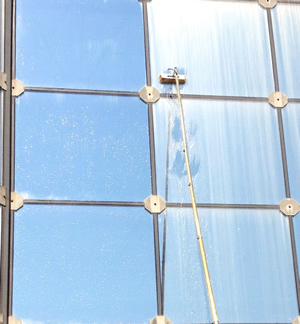 What is The Stewards Window Cleaning System? The Stewards Window Cleaning System takes no short cuts. It is based on a simplified, yet reliable method that yields a clean, streak free window on each cleaning. First, a Scrubber (technically, a lambs wool, cloth distributor) is used to apply water and the Stewards special cleaning solution to the window or glass that is to be cleaned. 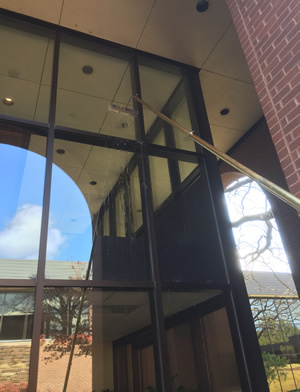 Second, a window cleaning razor blade is scraped across the glass to remove any paint, hard water grime, concrete, gum, tape, or debris build up from the glass. Third, a second layer of the Stewards cleaning solution is applied. 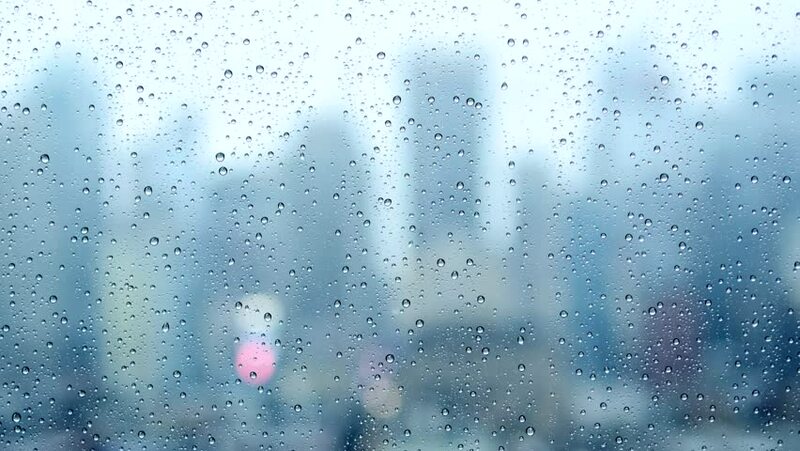 Fourth, a special rubber squeegee made by Ettore is wiped across the window in a swirl-type motion to remove the soap, dirt, and water from the window. Finally, the frames, sills, and edges of the windows are wiped down with high density micro fiber rags. How Does the Stewards Window Cleaning work? For Commercial window cleaning of buildings 3 stories or higher, the Stewards uses the reputable Tucker Pole system, with De-ionized water and soap propelled up to 45 feet high, through a copper pole and double hose system to spray down the windows. A brush is attached to the end of the Tucker Pole which scrubs the window free of grime. The Tucker pole then sprays down the window with a streak and spot free rinse to ensure clean glass. 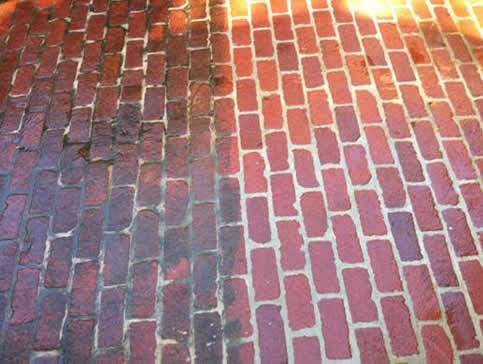 Brick Patio that had not been cleaned since 1996! Why your windows should be cleaned with The Stewards System? With professionally trained technicians, thorough “hands on” cleaning methods, high end customer service, including reminder and follow up calls before and after your cleans, and a Guaranteed Satisfaction plan, meaning if you’re not happy, we’ll come out and re-clean or touch up your windows free of charge, you know that you can trust in the Stewards Company. 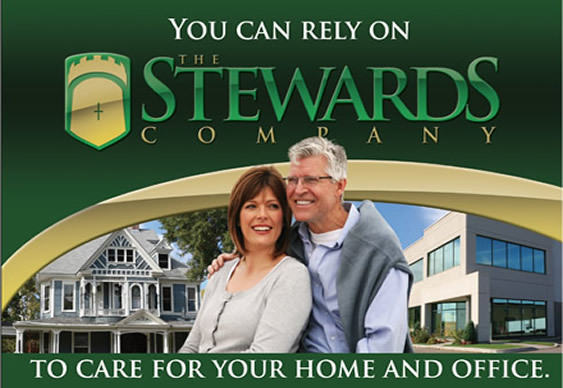 You can trust in the Stewards Company to care for your most personal investment: Your home. With our 20 point checklist, full insurance coverage, professionally trained staff, Guaranteed Satisfaction plan, and high touch customer service, we’ve got you covered. ****If a storm window breaks due to negligence of The Stewards Company Window Cleaning, the part will be replaced at no cost to the customer. However, if a storm window breaks due to improper fitting, missing parts existing breaks or previous damage, The Stewards Company Window Cleaning will not be held liable and the homeowner will be charged for all costs incurred to replace window.